Be the first to share your favorite memory, photo or story of Layne. This memorial page is dedicated for family, friends and future generations to celebrate the life of their loved one. Mr. Layne Cates of Hereford, Texas, passed away Saturday, July 14 at the age of 28. Layne was born on May 10, 1990 in Clovis, New Mexico to Dewayne and Vicki (Howard) Cates. The family moved to Hereford in 1990. Layne graduated from Hereford High School in 2008. He was an Eagle Scout in the Boy Scouts of America. He was also involved with the Kwahadi Dancers of Amarillo. Layne studied at Texas Tech University. He loved to learn and was eager to find an understanding of the universe. 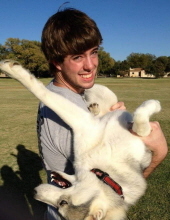 Layne enjoyed reading and working out and was devoted to his Husky-Wolf Blaize. Layne leaves behind his grandparents Jo and J.D. (deceased) Ray of Hereford, Texas, J. B. and Jane (deceased)Howard of Quitman Texas, and Marie and Alvin (deceased) Cates of Farwell, Texas, his parents Dewayne and Vicki Cates of Hereford, Texas, and his brothers Nathan of Hereford, Texas and Mitchell Cates and fiancé Kendra Jones of Lubbock, Texas. Other survivors include his aunt Bobbie King and Robert Strange of Hereford, Texas, and his cousin Stephanie Shaw of Clovis, New Mexico as well as many other aunts, uncles, and cousins. The family requests that, in lieu of flowers, donations be made to the Deaf Smith County Animal Shelter or the Texas Boys Ranch of Lubbock. Rev. John Henley will be officiating. "Email Address" would like to share the life celebration of Layne Daniel Cates. Click on the "link" to go to share a favorite memory or leave a condolence message for the family.